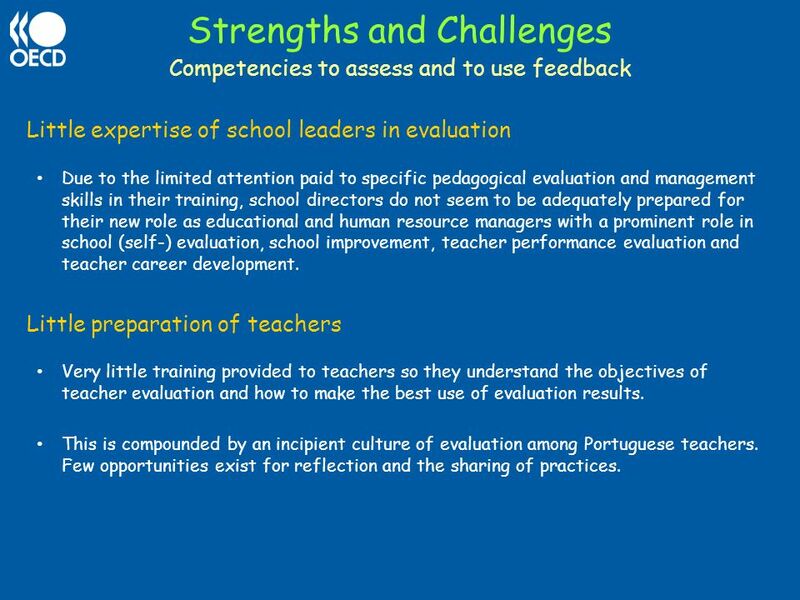 Overall framework for teacher evaluation The centrality of teacher evaluation The development of teacher evaluation in Portugal is a vital step in the drive to improve the effectiveness of teaching and learning and raise educational standards. Given the lack of evaluation culture in Portuguese schools, it has taken political courage from the Government to appropriately place teacher evaluation at the core of school reforms. The consensus gained about the need for teacher evaluation Clear impression that there is now consensus within the teaching profession about the need for teachers to be evaluated. Evaluation as part of a development process is particularly valued. There is a clear conviction that the previous teacher evaluation model was not achieving its purposes and a new model was needed. This is no minor achievement and is a major asset on which to build. Overall framework for teacher evaluation The double purpose of teacher evaluation: improvement and accountability It is appropriate that teacher evaluation serves a double purpose: improvement and accountability. 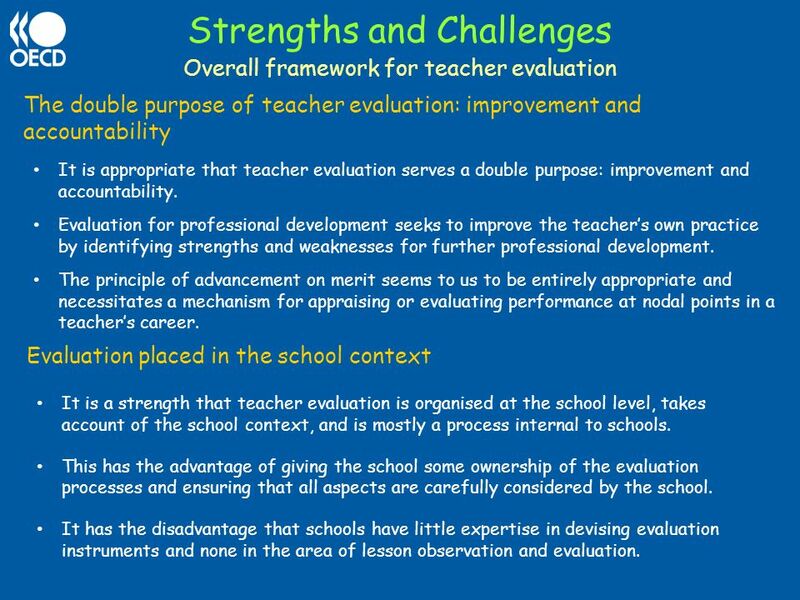 Evaluation for professional development seeks to improve the teacher’s own practice by identifying strengths and weaknesses for further professional development. The principle of advancement on merit seems to us to be entirely appropriate and necessitates a mechanism for appraising or evaluating performance at nodal points in a teacher’s career. Evaluation placed in the school context It is a strength that teacher evaluation is organised at the school level, takes account of the school context, and is mostly a process internal to schools. This has the advantage of giving the school some ownership of the evaluation processes and ensuring that all aspects are carefully considered by the school. It has the disadvantage that schools have little expertise in devising evaluation instruments and none in the area of lesson observation and evaluation. Overall framework for teacher evaluation The lack of pedagogical leadership No tradition that school directors exert pedagogical leadership of the school and take ultimate professional responsibility for the quality of education provided by the school. It is indicative that the best and most constructive experiences of teacher evaluation we came across were associated with more determined and far-sighted school directors. The move to School Councils and new arrangements for electing school directors on merit are an important first step in establishing leadership culture and expectations. The lack of ‘open door’ climate It is a significant strength of the current teacher evaluation system that it provides a means by which the practice of teachers is exposed to daylight - the opening up of classroom practice to constructive professional scrutiny. To be effective, evaluation for professional development requires a culture in which there is developmental classroom observation, professional feedback, peer discussion and coaching opportunities. This requires an ‘open-door’ climate of willingness to share classroom practice which is virtually unknown in the Portuguese education system. Overall framework for teacher evaluation The tension between the improvement and accountability functions Combining both the improvement and career progression functions into a single teacher evaluation process raises difficult challenges. When teachers are confronted with potential consequences of evaluation on their career and salary, the inclination to reveal weak aspects of performance is reduced, i.e. the improvement function is jeopardised. These risks are compounded in the Portuguese context of lack of maturity of teacher evaluation. Dominance of career progression over improvement aspects The developmental opportunities of evaluation have been dominated by the issues related to career progression. In some way the system is trying to achieve improvement through accountability which causes tensions. 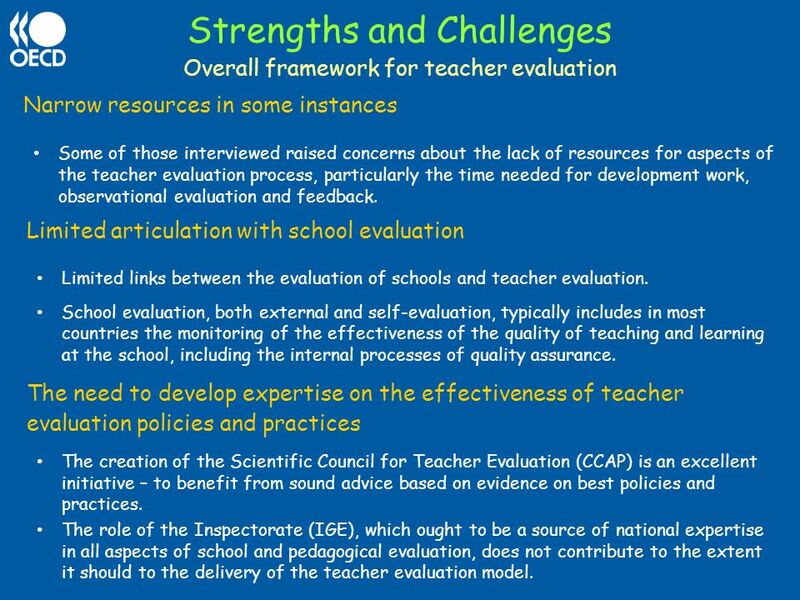 Overall framework for teacher evaluation Narrow resources in some instances Some of those interviewed raised concerns about the lack of resources for aspects of the teacher evaluation process, particularly the time needed for development work, observational evaluation and feedback. 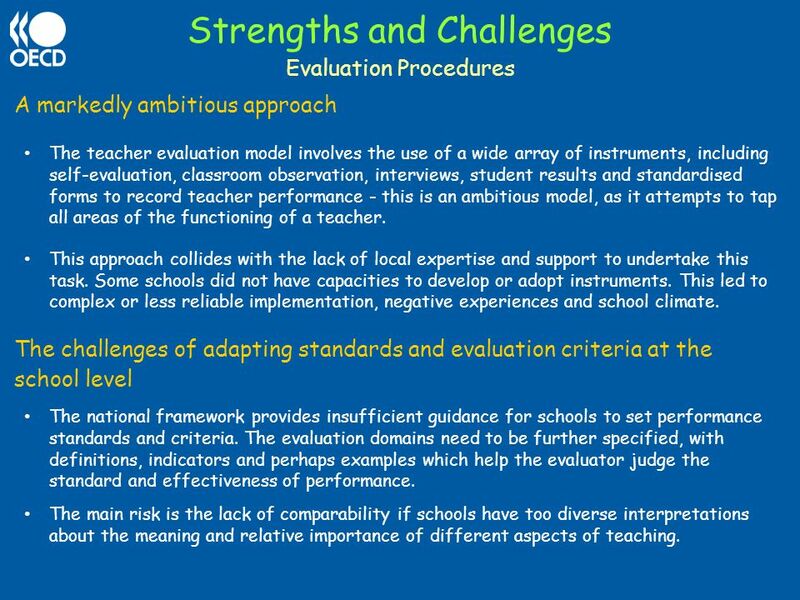 Limited articulation with school evaluation Limited links between the evaluation of schools and teacher evaluation. School evaluation, both external and self-evaluation, typically includes in most countries the monitoring of the effectiveness of the quality of teaching and learning at the school, including the internal processes of quality assurance. The need to develop expertise on the effectiveness of teacher evaluation policies and practices The creation of the Scientific Council for Teacher Evaluation (CCAP) is an excellent initiative – to benefit from sound advice based on evidence on best policies and practices. The role of the Inspectorate (IGE), which ought to be a source of national expertise in all aspects of school and pedagogical evaluation, does not contribute to the extent it should to the delivery of the teacher evaluation model. Evaluation Procedures The centrality of classroom observation The pivotal role given to classroom observation in the teacher evaluation model is appropriate. Teaching practices and evidence of learning are the most relevant sources of information about professional performance - classroom observations are the most common source of evidence used in OECD countries. The importance of self-reflection We endorse the key role of self-evaluation. The perspective of the teacher being evaluated is essential, because it allows evaluatees to express their own views about their performance, and reflect on the personal, organisational and institutional factors that had an impact on their teaching. Evaluation Procedures Multiple sources of evidence and multiple evaluators The teacher evaluation model is comprehensive, includes most domains of teacher performance, a wide range of sources of data, provides for more than one evaluator and has a peer-review element. The functional performance component It is a positive feature that the current model provides for a component to assess the functional performance of the teacher within the school. This recognises the fact that the demands on schools and teachers are becoming more complex and teachers have their areas of responsibility broadened. Evaluation Procedures A markedly ambitious approach The teacher evaluation model involves the use of a wide array of instruments, including self-evaluation, classroom observation, interviews, student results and standardised forms to record teacher performance - this is an ambitious model, as it attempts to tap all areas of the functioning of a teacher. This approach collides with the lack of local expertise and support to undertake this task. Some schools did not have capacities to develop or adopt instruments. This led to complex or less reliable implementation, negative experiences and school climate. The challenges of adapting standards and evaluation criteria at the school level The national framework provides insufficient guidance for schools to set performance standards and criteria. The evaluation domains need to be further specified, with definitions, indicators and perhaps examples which help the evaluator judge the standard and effectiveness of performance. The main risk is the lack of comparability if schools have too diverse interpretations about the meaning and relative importance of different aspects of teaching. 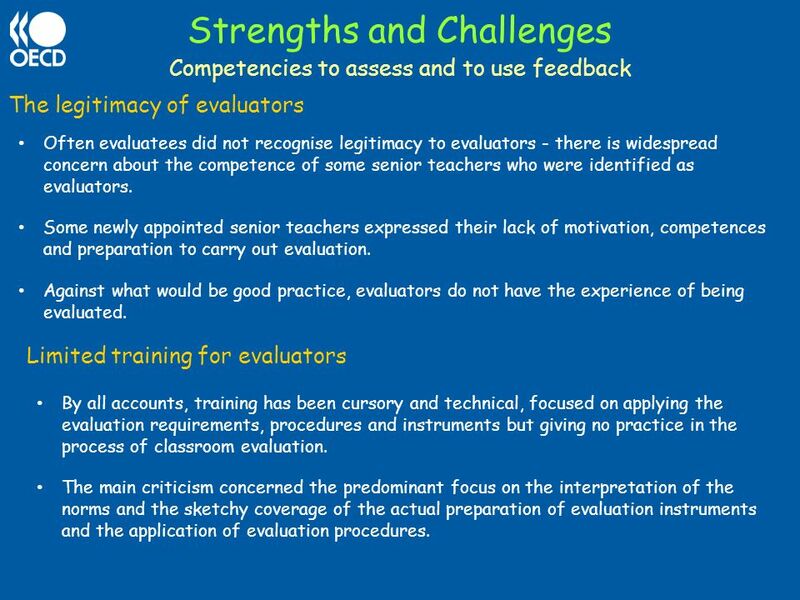 Competencies to assess and to use feedback The legitimacy of evaluators Often evaluatees did not recognise legitimacy to evaluators - there is widespread concern about the competence of some senior teachers who were identified as evaluators. Some newly appointed senior teachers expressed their lack of motivation, competences and preparation to carry out evaluation. Against what would be good practice, evaluators do not have the experience of being evaluated. Limited training for evaluators By all accounts, training has been cursory and technical, focused on applying the evaluation requirements, procedures and instruments but giving no practice in the process of classroom evaluation. The main criticism concerned the predominant focus on the interpretation of the norms and the sketchy coverage of the actual preparation of evaluation instruments and the application of evaluation procedures. Competencies to assess and to use feedback Little expertise of school leaders in evaluation Due to the limited attention paid to specific pedagogical evaluation and management skills in their training, school directors do not seem to be adequately prepared for their new role as educational and human resource managers with a prominent role in school (self-) evaluation, school improvement, teacher performance evaluation and teacher career development. Little preparation of teachers Very little training provided to teachers so they understand the objectives of teacher evaluation and how to make the best use of evaluation results. 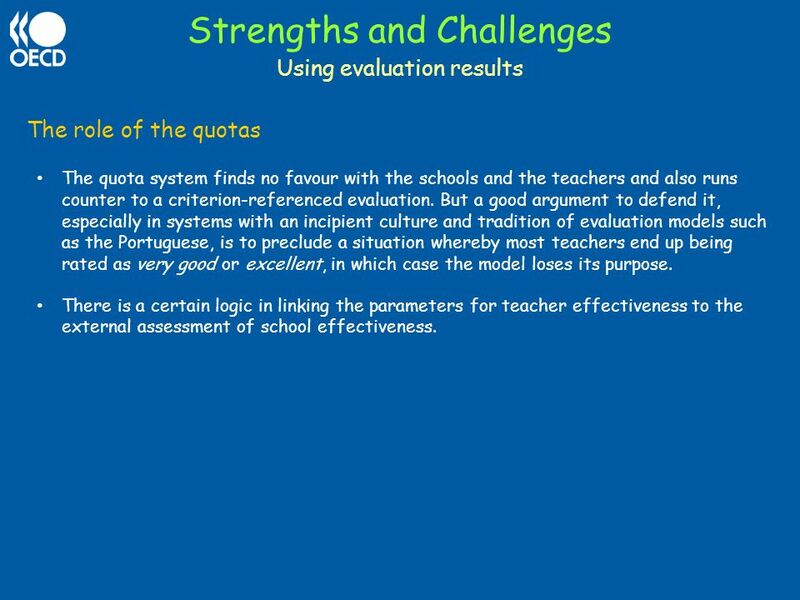 This is compounded by an incipient culture of evaluation among Portuguese teachers. Few opportunities exist for reflection and the sharing of practices. Using evaluation results Evaluation with a view to improve practice and reward performance Appropriately teacher evaluation is intended to identify areas of improvement for individual teachers, and lead to the preparation of individual improvement plans which take into account the overall school development plan. The principle of career advancement on merit is also appropriate. Evaluation of teacher performance is also to be used as a basis for recognition and celebration of a teacher’s work. The tension between school-level evaluation and national-level consequences There is a clear tension between school-level standards for teacher evaluation and national-level consequences of teacher evaluation. Local interpretation of central government guidelines, as reference standards and evaluation criteria are defined at the school level, risks a lack of consistency and equity in career-progression evaluation. Our view is that evaluation for career progression may not be effectively handled within an entirely internal evaluation system. Using evaluation results The role of the quotas The quota system finds no favour with the schools and the teachers and also runs counter to a criterion-referenced evaluation. But a good argument to defend it, especially in systems with an incipient culture and tradition of evaluation models such as the Portuguese, is to preclude a situation whereby most teachers end up being rated as very good or excellent, in which case the model loses its purpose. There is a certain logic in linking the parameters for teacher effectiveness to the external assessment of school effectiveness. 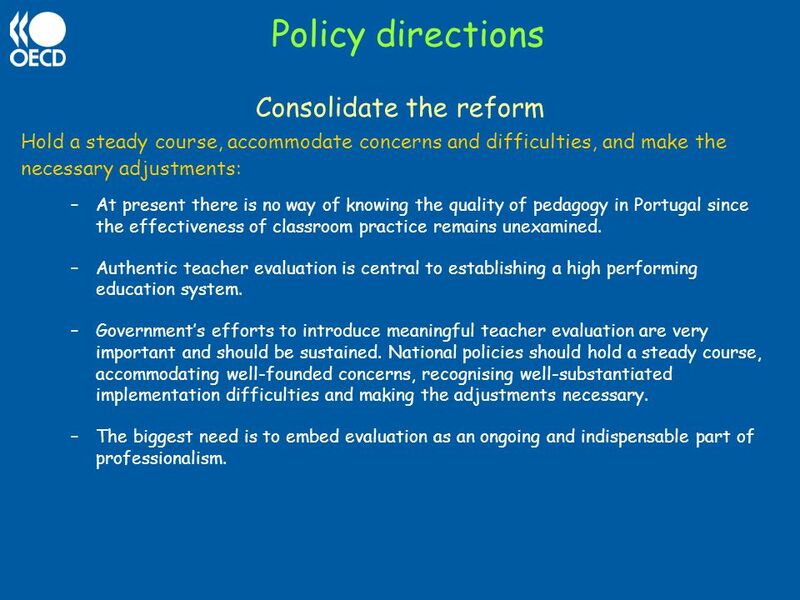 Policy directions Consolidate the reform Hold a steady course, accommodate concerns and difficulties, and make the necessary adjustments: At present there is no way of knowing the quality of pedagogy in Portugal since the effectiveness of classroom practice remains unexamined. Authentic teacher evaluation is central to establishing a high performing education system. Government’s efforts to introduce meaningful teacher evaluation are very important and should be sustained. National policies should hold a steady course, accommodating well-founded concerns, recognising well-substantiated implementation difficulties and making the adjustments necessary. The biggest need is to embed evaluation as an ongoing and indispensable part of professionalism. 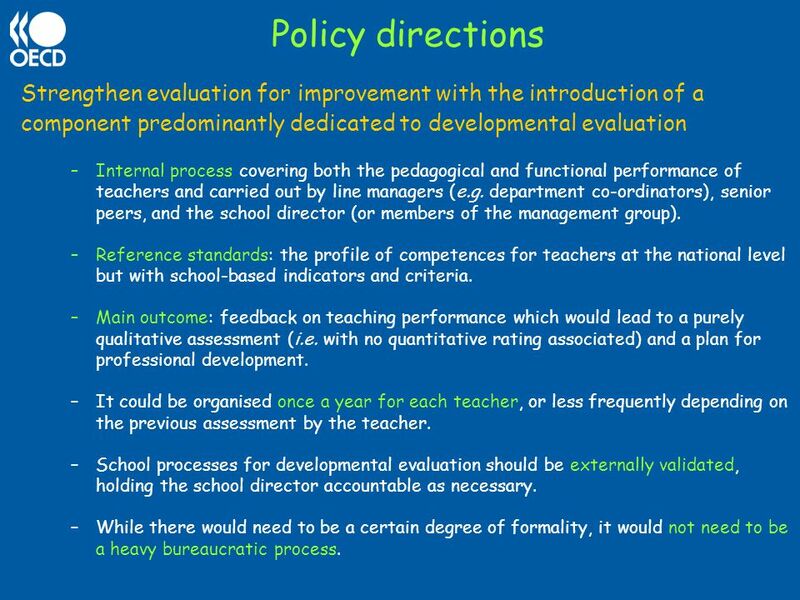 17 Policy directions Balance the improvement and accountability functions and place school-level teacher evaluation in the broader school system context In order to resolve the two main tensions in the system, the following approach is proposed: Strengthen teacher evaluation for improvement with the introduction of a component predominantly dedicated to developmental evaluation, fully internal to the school. Lighten the current model for use as predominantly career-progression teacher evaluation, mostly internal to the school but with an external element, based on common national-level criteria across schools, and with consequences for career advancement. 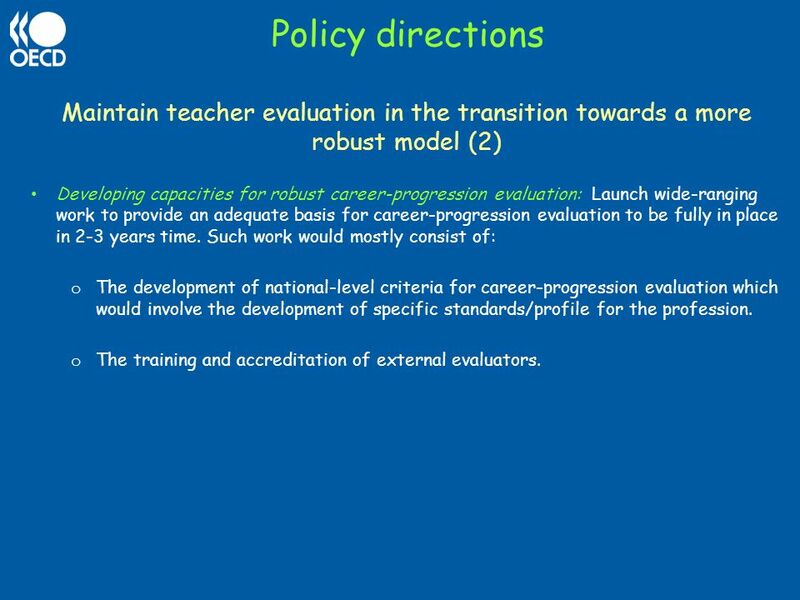 Ensure links between developmental evaluation and career-progression evaluation. Ensure appropriate articulation between school and teacher evaluation. 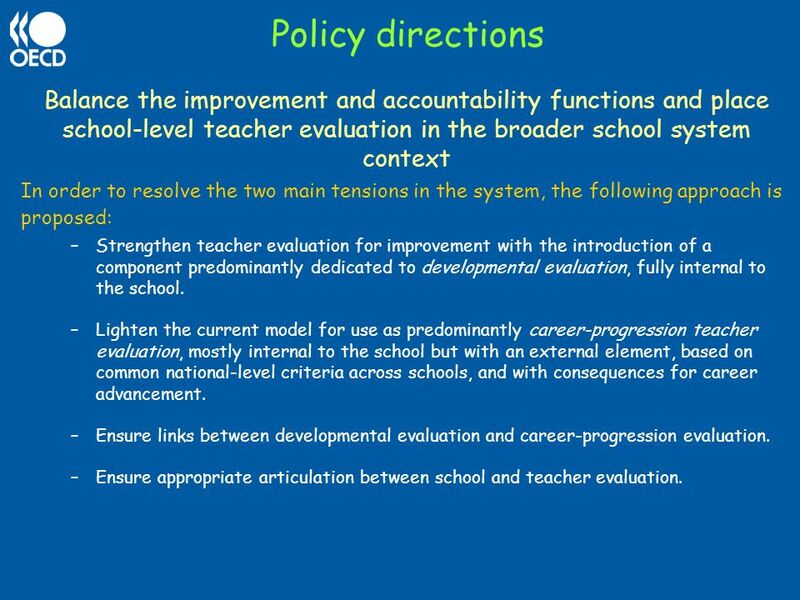 18 Policy directions Strengthen evaluation for improvement with the introduction of a component predominantly dedicated to developmental evaluation Internal process covering both the pedagogical and functional performance of teachers and carried out by line managers (e.g. department co-ordinators), senior peers, and the school director (or members of the management group). Reference standards: the profile of competences for teachers at the national level but with school-based indicators and criteria. Main outcome: feedback on teaching performance which would lead to a purely qualitative assessment (i.e. with no quantitative rating associated) and a plan for professional development. It could be organised once a year for each teacher, or less frequently depending on the previous assessment by the teacher. School processes for developmental evaluation should be externally validated, holding the school director accountable as necessary. While there would need to be a certain degree of formality, it would not need to be a heavy bureaucratic process. 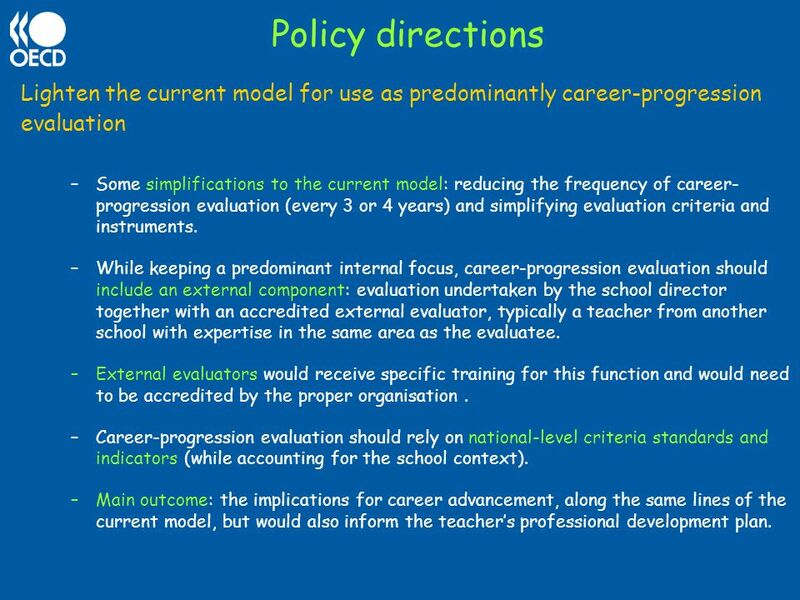 19 Policy directions Lighten the current model for use as predominantly career-progression evaluation Some simplifications to the current model: reducing the frequency of career-progression evaluation (every 3 or 4 years) and simplifying evaluation criteria and instruments. 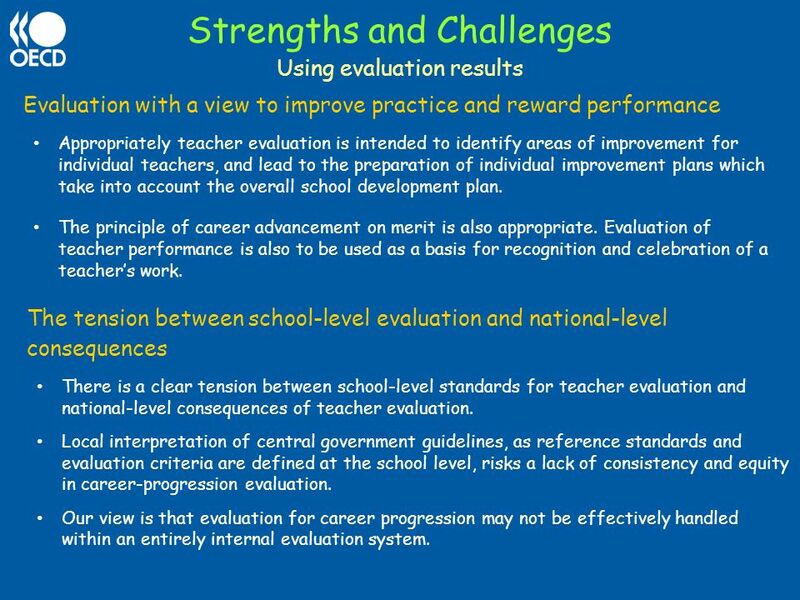 While keeping a predominant internal focus, career-progression evaluation should include an external component: evaluation undertaken by the school director together with an accredited external evaluator, typically a teacher from another school with expertise in the same area as the evaluatee. External evaluators would receive specific training for this function and would need to be accredited by the proper organisation . Career-progression evaluation should rely on national-level criteria standards and indicators (while accounting for the school context). Main outcome: the implications for career advancement, along the same lines of the current model, but would also inform the teacher’s professional development plan. 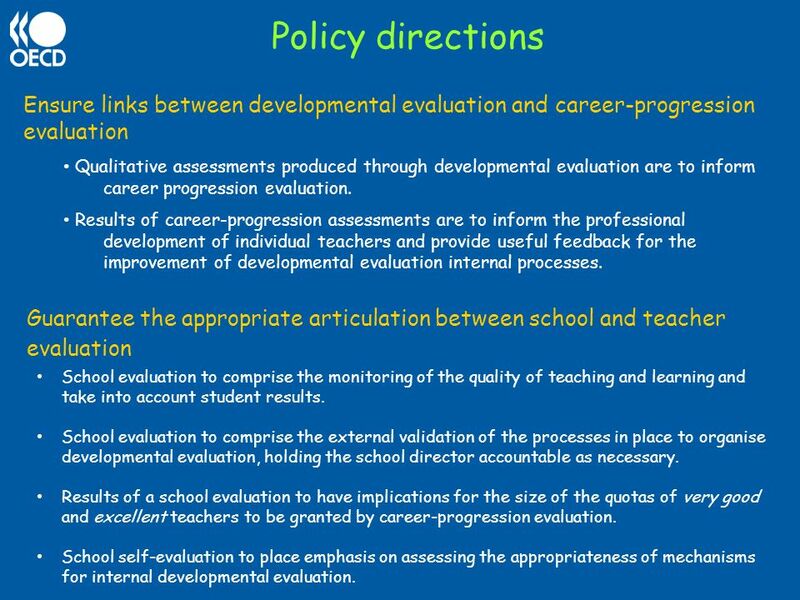 20 Policy directions Ensure links between developmental evaluation and career-progression evaluation Qualitative assessments produced through developmental evaluation are to inform career progression evaluation. Results of career-progression assessments are to inform the professional development of individual teachers and provide useful feedback for the improvement of developmental evaluation internal processes. Guarantee the appropriate articulation between school and teacher evaluation School evaluation to comprise the monitoring of the quality of teaching and learning and take into account student results. 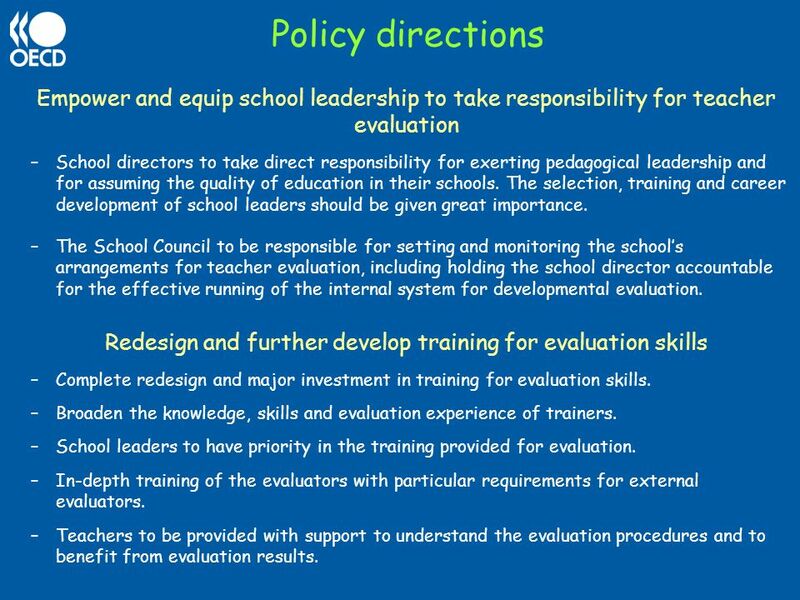 School evaluation to comprise the external validation of the processes in place to organise developmental evaluation, holding the school director accountable as necessary. Results of a school evaluation to have implications for the size of the quotas of very good and excellent teachers to be granted by career-progression evaluation. School self-evaluation to place emphasis on assessing the appropriateness of mechanisms for internal developmental evaluation. Policy directions Focus national criteria and standards on key aspects Re-examine profession-wide standards and reach a shared understanding of what counts as accomplished teaching A national framework of teaching standards is essential for teacher evaluation. 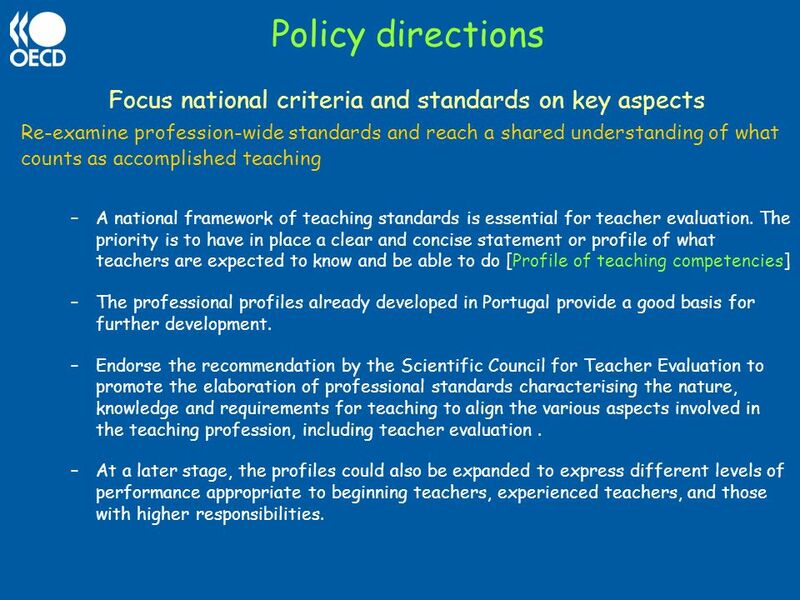 The priority is to have in place a clear and concise statement or profile of what teachers are expected to know and be able to do [Profile of teaching competencies] The professional profiles already developed in Portugal provide a good basis for further development. Endorse the recommendation by the Scientific Council for Teacher Evaluation to promote the elaboration of professional standards characterising the nature, knowledge and requirements for teaching to align the various aspects involved in the teaching profession, including teacher evaluation . At a later stage, the profiles could also be expanded to express different levels of performance appropriate to beginning teachers, experienced teachers, and those with higher responsibilities. 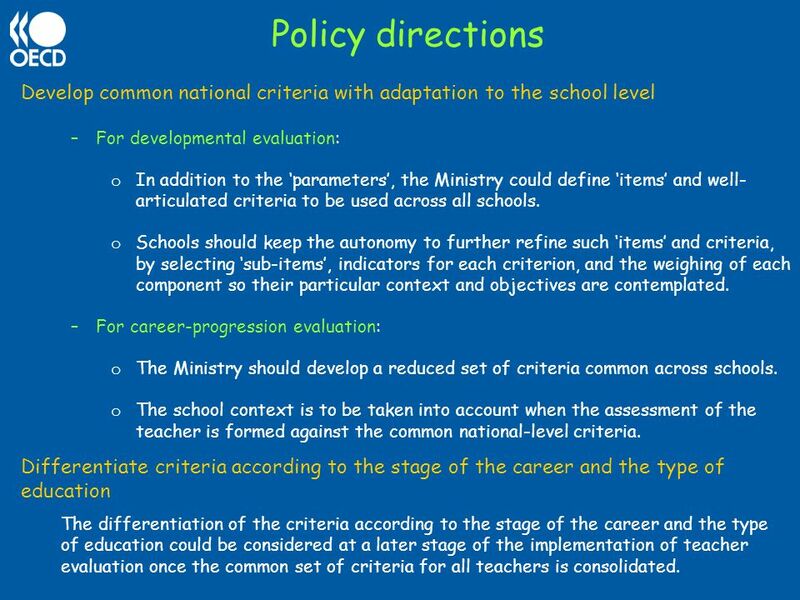 22 Policy directions Develop common national criteria with adaptation to the school level For developmental evaluation: In addition to the ‘parameters’, the Ministry could define ‘items’ and well-articulated criteria to be used across all schools. Schools should keep the autonomy to further refine such ‘items’ and criteria, by selecting ‘sub-items’, indicators for each criterion, and the weighing of each component so their particular context and objectives are contemplated. For career-progression evaluation: The Ministry should develop a reduced set of criteria common across schools. The school context is to be taken into account when the assessment of the teacher is formed against the common national-level criteria. Differentiate criteria according to the stage of the career and the type of education The differentiation of the criteria according to the stage of the career and the type of education could be considered at a later stage of the implementation of teacher evaluation once the common set of criteria for all teachers is consolidated. 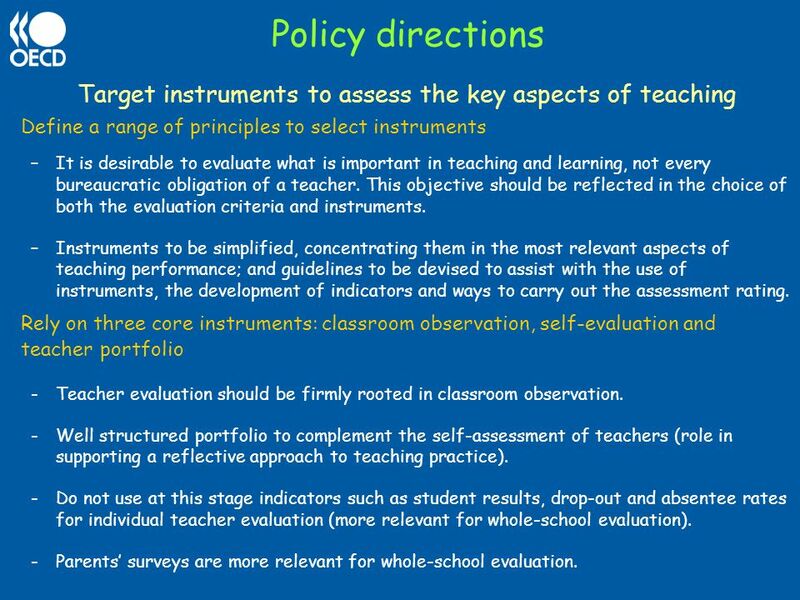 Policy directions Target instruments to assess the key aspects of teaching Define a range of principles to select instruments It is desirable to evaluate what is important in teaching and learning, not every bureaucratic obligation of a teacher. This objective should be reflected in the choice of both the evaluation criteria and instruments. Instruments to be simplified, concentrating them in the most relevant aspects of teaching performance; and guidelines to be devised to assist with the use of instruments, the development of indicators and ways to carry out the assessment rating. Rely on three core instruments: classroom observation, self-evaluation and teacher portfolio Teacher evaluation should be firmly rooted in classroom observation. Well structured portfolio to complement the self-assessment of teachers (role in supporting a reflective approach to teaching practice). Do not use at this stage indicators such as student results, drop-out and absentee rates for individual teacher evaluation (more relevant for whole-school evaluation). Parents’ surveys are more relevant for whole-school evaluation. Policy directions Empower and equip school leadership to take responsibility for teacher evaluation School directors to take direct responsibility for exerting pedagogical leadership and for assuming the quality of education in their schools. The selection, training and career development of school leaders should be given great importance. The School Council to be responsible for setting and monitoring the school’s arrangements for teacher evaluation, including holding the school director accountable for the effective running of the internal system for developmental evaluation. Redesign and further develop training for evaluation skills Complete redesign and major investment in training for evaluation skills. Broaden the knowledge, skills and evaluation experience of trainers. School leaders to have priority in the training provided for evaluation. In-depth training of the evaluators with particular requirements for external evaluators. Teachers to be provided with support to understand the evaluation procedures and to benefit from evaluation results. 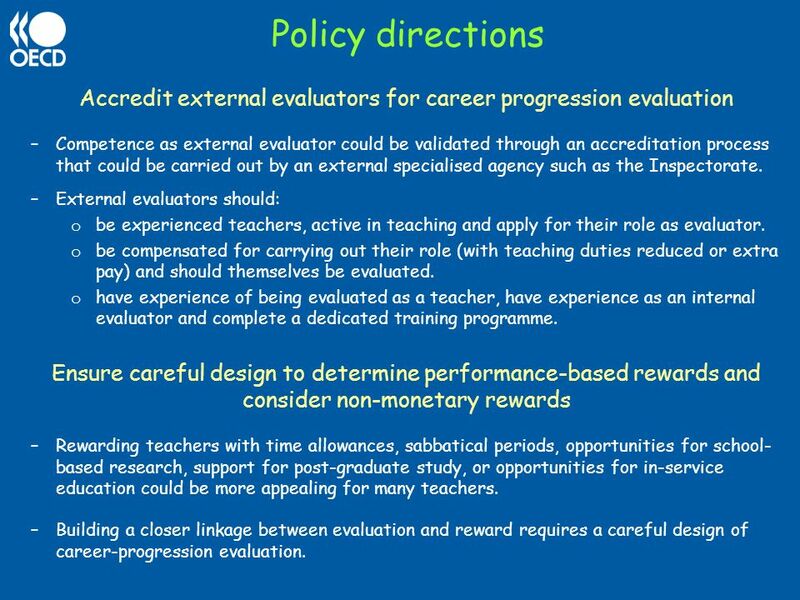 Policy directions Accredit external evaluators for career progression evaluation Competence as external evaluator could be validated through an accreditation process that could be carried out by an external specialised agency such as the Inspectorate. External evaluators should: be experienced teachers, active in teaching and apply for their role as evaluator. be compensated for carrying out their role (with teaching duties reduced or extra pay) and should themselves be evaluated. have experience of being evaluated as a teacher, have experience as an internal evaluator and complete a dedicated training programme. Ensure careful design to determine performance-based rewards and consider non-monetary rewards Rewarding teachers with time allowances, sabbatical periods, opportunities for school-based research, support for post-graduate study, or opportunities for in-service education could be more appealing for many teachers. Building a closer linkage between evaluation and reward requires a careful design of career-progression evaluation. 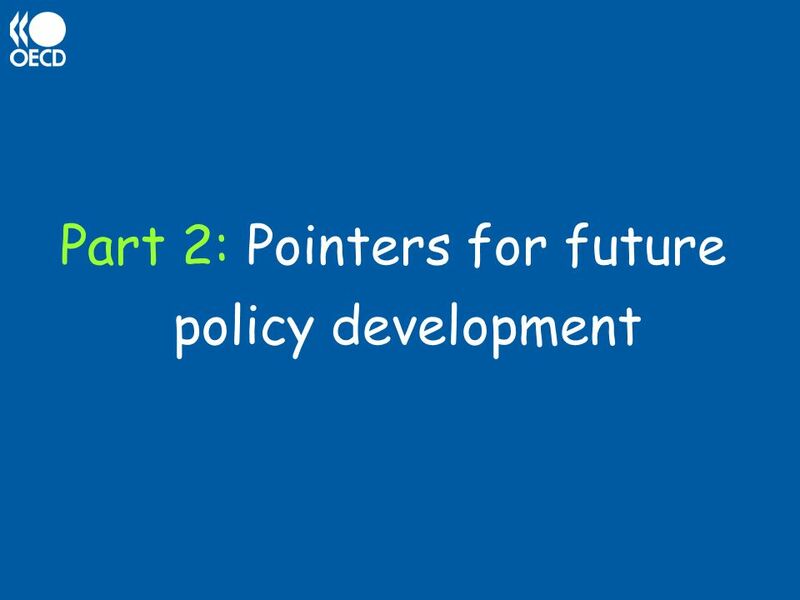 Policy directions Maintain quotas until the maturity of the system renders them unnecessary Retain the school quota system until evaluators are sufficiently proficient and criteria sufficiently explicit to render school quotas unnecessary. It is appropriate to associate the performance of teachers with the performance of a school, having taken contextual factors into account. Give a more prominent role to the Inspectorate Modelling and disseminating good practice in teacher evaluation. Possibly the validation of schools’ internal quality assurance arrangements and the accreditation of external evaluators. 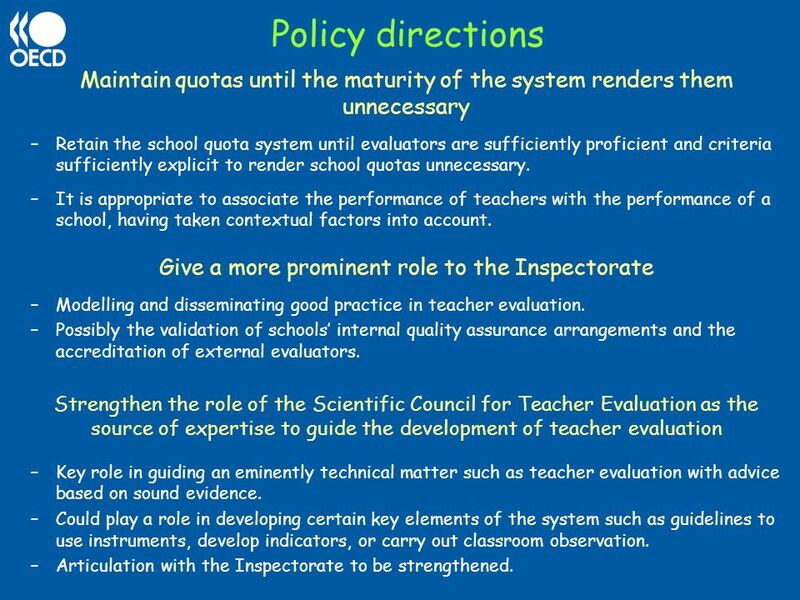 Strengthen the role of the Scientific Council for Teacher Evaluation as the source of expertise to guide the development of teacher evaluation Key role in guiding an eminently technical matter such as teacher evaluation with advice based on sound evidence. Could play a role in developing certain key elements of the system such as guidelines to use instruments, develop indicators, or carry out classroom observation. Articulation with the Inspectorate to be strengthened. 27 Policy directions Maintain teacher evaluation in the transition towards a more robust model (1) The transition towards the proposed model would involve maintaining teacher evaluation with a view to strengthen developmental evaluation within schools and developing capacities needed to support a more robust career-progression evaluation model: Strengthening of developmental evaluation within schools: Schools develop arrangements for developmental evaluation to be externally validated in 2-3 years time. It should lead, for each teacher in the school, to a qualitative assessment and to a professional development plan (to include a classroom observation element for all teachers). Teachers request an assessment rating on a voluntary basis for career progression purposes. As with current arrangements, regular progression through the career could be achieved with functional evaluation only, while the possibility of moving more rapidly through the career scale would require a scientific-pedagogical evaluation with classroom observation. 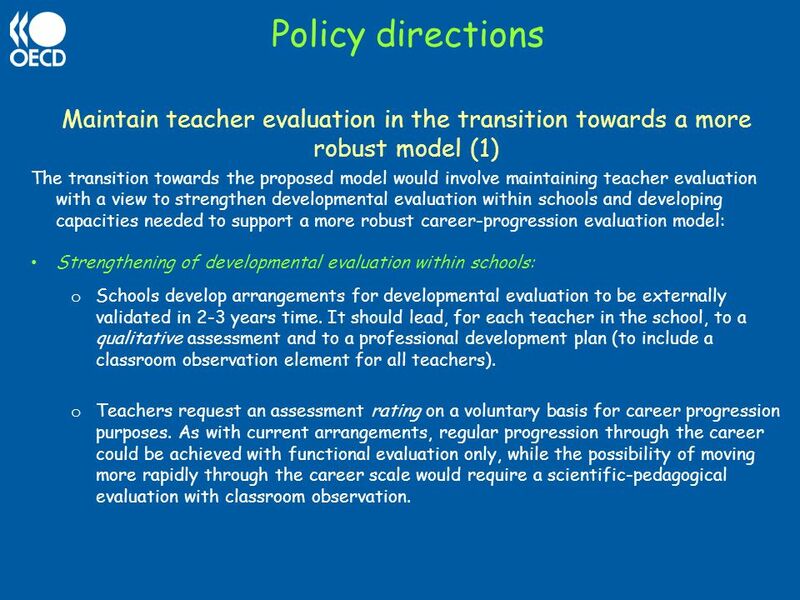 28 Policy directions Maintain teacher evaluation in the transition towards a more robust model (2) Developing capacities for robust career-progression evaluation: Launch wide-ranging work to provide an adequate basis for career-progression evaluation to be fully in place in 2-3 years time. Such work would mostly consist of: The development of national-level criteria for career-progression evaluation which would involve the development of specific standards/profile for the profession. The training and accreditation of external evaluators. 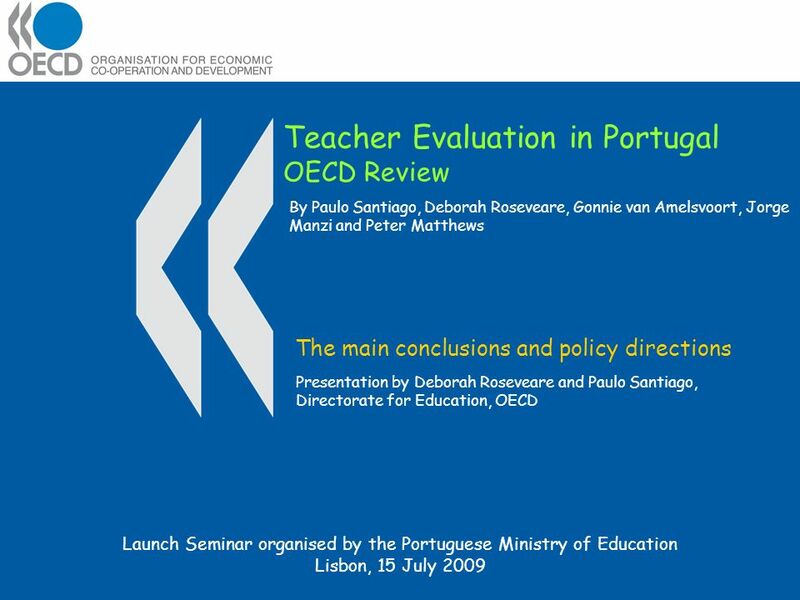 Download ppt "Teacher Evaluation in Portugal OECD Review"
Assessment Systems for the Future: the place of assessment by teachers A project of the Assessment Reform Group, funded by the Nuffield Foundation. LITERACY STRATEGY P Loddon Mallee Region. Working with the Teachers’ Standards in the context of ITE. Some key issues for ITE Partnerships to explore. School Based Assessment and Reporting Unit Curriculum Directorate Reporting. A Snapshot of TEQSA Dr Carol Nicoll Chief Commissioner Festival of Learning and Teaching University of Adelaide Tuesday 6 November 2012. 1 School Inspection Update Key Changes since January 2014 Updates continued 17 June 2014 Name Farzana Aldridge – Strategic Director & Caroline Lansdown.